I am sharing all the Things I’m Loving Lately that are part of the Nordstrom Anniversary Sale. Don’t miss it! The Nordstrom Anniversary Sale is officially open to the public! You guys, do you know what this means? You don’t need a Nordstrom card for access to sale items. Everyone has access now! That means all the products I highlighted in the Best Sale of the Year: Nordstrom Anniversary Sale + the Best Activewear Deals posts are all fair game. I haven’t done a Things I’m Loving Lately post in a quite a while, so it only seemed natural to write one on all of my favorite finds from the Nordstrom Sale. Linley and I made two stops at Nordstrom during the pre-sale. 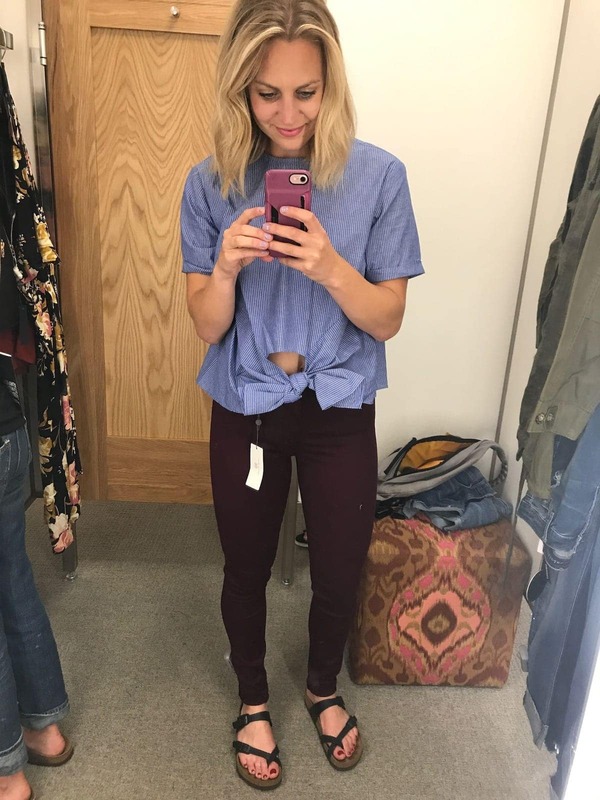 We hit up the only two Nordstrom stores in Minnesota- Ridgedale Mall and the Mall of America locations. We wanted to see if product varied between stores and it did! We found different gems at each store. From workout gear to jeans for fall, we found alllmost everything we were looking for. I say almost because if you have shopped the sale at all online, you may have noticed that some things are sold out. Nordstrom does have a couple of restock days (heck yes), so I am crossing my fingers that some to of the things I’m still looking for will be restocked! I am still in the market for a pair of new boots, a dress for wedding season, and one more pair of skinny jeans. 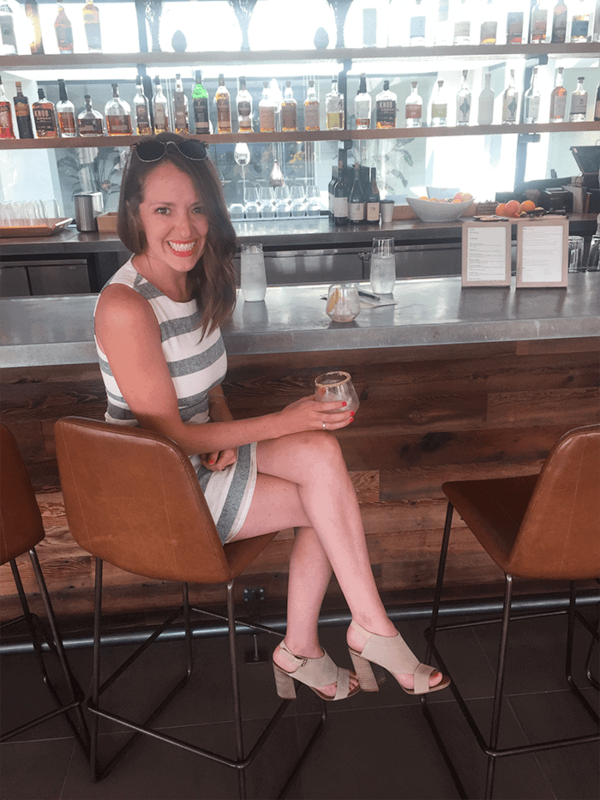 Without further adieu, here are All the Things I’m Loving Lately….. I love high waisted workout pants. It’s a fact, whenever I give another fit a try, I always have regrets. That’s why right now I am loving the Zella CeCe High Waist Open Knee Leggings + Zella Knockout High-waisted Leggings (sale:$42.90 after sale: $65.00). GET THEM NOW. I’ve also been loving my NIKE Essential Muscle Tank–because it’s a classic. You can dress it up or down. Day to day goodies I’ve been loving lately from the sale are everything from casual dresses, to jeans, to this ADORABLE Tie Front Blouse by BP. This top sells out SO fast. However, they restocked yesterday and both blue and white are available (sale: $39.90. after sale: $49.00)! Lastly, I love my new maroon Farrah High Waisted Skinny Jeans by AG. They were one of my splurge items (sale: $125.90 after sale:$188.00) I was in the market for a pair of colored jeans that fit my waist AND my legs. I found them and I have no regrets! Lastly, SO many of you have been asking about my most recent Birekenstock purchase (I have been wearing them in ALL pictures lately)! Though they are not in the sale, they are my FAVORITE shoe right now. They are the Birekenstock Mayari Birko-flor Sandal. There are a couple weeks left of the sale. The final day is August 6th and I’m in the market for some new boots for fall + winter and maybe a classic pair of converse tennis shoes (sale: $35.96 after sale: $59.95). I have found the jeans that my body was made for– Articles of Society. The Mya Jeans are by far my favorite fit and the BEST deal I’ve found on jeans so far (sale:$38.90 after sale:$59.00). I am loving them. They fit my waist like, whoa. They have just a little bit of stretch in them, I love the wash, and so much more. Right now, you can only get them in certain sizes, so check RIGHT NOW for your size and keep your eyes peeled . They are restocking sizes once a week, so don’t freak out if you can’t find your size. Luckily, Nordstrom also has many other Articles of Society Jeans that are included in the sale as well. I may have bought two more pairs before leaving for California. Wedding season is here. So many of my besties are getting married this year and it’s about time that I bought a couple nice dresses for wedding season. I do like to buy dresses that I can wear more than once and Nordstrom has SO many adorable transition dresses (dresses that i can wear in the summer + fall). My next mission when we visit Nordstrom for the sale is to find a DRESS. Linley is just as obsessed with Zella (Nordstrom’s exclusive workout brand) as I am. She went for the Mirage Longline Sports Bra (sale: $35.90 after Sale: $55.00) and the Black Knockout High-waisted Leggings (sale:$42.90 after sale: $65.00)! Linley tried on these SARTO Suzie Cage Sandals by Franco Sarto and they were not part of the Nordstrom Anniversary Sale, but we just couldn’t help it. I mean…look at them. They were a must buy and they were totally WORTH IT. PHEW. Now that you’ve seen all the things I’m loving lately in the Nordstrom Anniversary Sale, go explore the Nordstrom Anniversary Sale site. Maybe you’ll find some new favorites!